In 1861, gold coins were issued for 1, 2 and 5 pesos. These were equal in gold content to the earlier Spanish coins of ½, 1 and 2 escudos. Silver coins were minted from 1864 in denominations of 10, 20 and 50 centimos de peso, with silver 1-peso coins issued in 1897. During the Revolutionary period, coins were issued in copper for 1 and 2 centavos and 2 centimos de peso. In 1903, a new coinage was introduced. It consisted of bronze ½ and 1 centavo, cupro-nickel 5 centavos and silver 10, 20 and 50 centavos and 1 peso. The silver coins were weight related to the peso which was minted in .900 fineness and contained 374.4 grains of silver. U.S. gold coins and ½ and 1 peso coins were legal tender for any amount, with 10 and 20 centavos coins being legal tender up to 20 pesos and smaller coins up to 2 pesos. The sizes and finenesses of the silver coins were reduced in 1907, with the peso now a 20 gram coin minted in .750 silver. Production of the 1 peso coin ceased in 1912 and that of the 50 centavos in 1921. The American Government deemed it more economical and convenient to mint silver coins in the Philippines, hence, the re-opening of the Manila Mint in 1920, which produced coins until the Commonwealth period. In 1937, coin designs were changed to reflect the establishment of the Commonwealth. No coins were minted in the years 1942 and 1943 due to the Japanese occupation, but minting resumed in 1944, including production of 50 centavos coins. Due to the large number of coins issued between 1944 and 1947, coins were not minted again until 1958. In 1958, a new, entirely base metal coinage was introduced, consisting of bronze 1 centavo, brass 5 centavos and nickel-brass 10, 25 and 50 centavos. In 1967, the coinage was altered to reflect the use of Filipino names for the currency units. 1-piso coins were introduced in 1972. In 1975, the "Ang Bagong Lipunan" series was introduced with the 5-piso coins included. Aluminium replaced bronze and cupro-nickel replaced nickel-brass that year. The Flora and Fauna series was introduced in 1983 which included 2-piso coins. The sizes of the coins were reduced in 1991, with production of 50-sentimo and 2-piso coins ceasing in 1994. 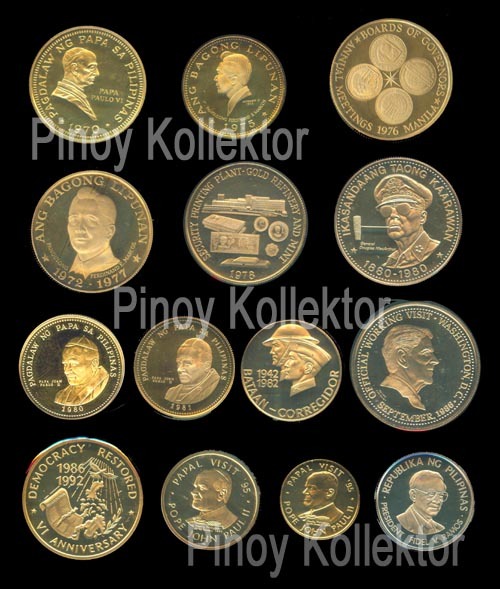 The current series of coins was introduced in 1995, with 10-piso coins added in 2000. Denominations below 1 piso are still issued but are not in wide use. In December 2008 a Philippine Congress resolution called for the retirement and demonetization of all coins less than one peso. HOW MUCH IS THE CURRENT MARKET PRICE FOR A CORY AQUINO(DEMOCRACY RESTORED)P10,000.00 GOLD COIN COMPLETE WITH BOX AND CERTIFICATE OF AUTHENTICITY? i would like to get these commemorative coins. Does BSP still sells or do you know someone selling these? i am very much interested in getting these coins for my collection. Good day. There are people going around our neighborhood asking for 1972-1974 1 peso coins and are willing to buy them at P1000 a piece. Do you have an idea how much they are really worth? i have 5 1peso coin 1972-1974... how much is this? i have 1868 isabel 2 of 50 cs de peso, how much this cost? thanks. we have a ten centavos silver 1903-1935 coin, how much it is? and also twenty centavos silver 1907-1929 coin, how much it is? magkano po bah talaga value ng 25 pesos silver coin issued by banko cetral? Anyone who wants to sell their coins? Txt me at 0926-3456-175 Philippine Coins Only. 1896 one dollar from my grand pa how much? hi do you buy 1972 and 1974 1 peso coins? anh how much is it? Pwede mo dalhin sa may sta. cruz, near Escolta bumibili sila nyan. look for Boy Flores, Vilma or Aling Nene .May pwesto sila sa sidewalk. I have 2 1864 isabella gold coins..txt me if interested, 09273709164.
sir visit nyo FB accnt ko,baka may magustuhan kayo, my accnt. is ARGENTO MONETA....tnxs..
hi i have a lot of old coins in my house. i have the one cent old coin by US PRES. abraham Lincoln Liberty 1966-2005.. HOW much the exact value of that right now..? Contact me if anyone is interested .. 09395051467. Thank you..
hi! i just sell my italia old coins silver from 1910-1990.. interested party's can text me 09395051467..
or you can visit my Facebook account to see some of my old coins collection that i sell also.. april_Poll@yahoo.com, here is my Fb add.. thank you and God bless..
i have 1 peso 1974 and ten centavos 1958,1966... marami ako nito pleas contact me, +639193634114..
i have 1980 1 sentimo, 5 sentimos, 10 sentimos, 25 sentimos, 1 piso, 5 piso, 25 piso. and i have 25 piso 1975 and 50 piso 1975.
if you interested please contact me. i have 4 sets of them. Hi, I've recently been given by my father his coin collection. I was wondering if I coud have them appraised by you in person? I live in Quezon City and very much willing to meet. Thank you in advance. How much the 5peso marcos coin? how much is the value of a 150 years rizal commemorative 1 peso coin? thank you! I am interested to buy 1920 gold coin.Please email me at anajeevan@gmail.com. Send a picture of the coin back and front with a cd player beside the coin so I can compare the size of the coin. magkano po ung 1971 rizal head..
May Rizal po ako 1972 ata! Magkano bili more? may coin po me yr 1881... magkano po kya i2 ngaun? my grandpa owns twenty pieces of the 1907 proof version of US-Philippines One peso silver coins. He sold one in the US auction and fetch around 250 thousand US dollars. I am really amazed how profitable coin collecting is..
On the Internet quite by accident I found a recent article by Timothy B. Benford, Yahoo! Contributor Network writer, who said (in his article about the dumping of millions of pesos into Manila Bay in 1942) that Philadelphia made several trial pieces of 1907 in which two pieces were presented for approval. If nothing else, his statement is further corroboration of the exceedingly rare status of the 1907 peso. Since U.S. mints had to replace nearly all of the Islands silver coinage in 1907 it was not felt that there were enough resources to make 1907 Proof Sets. When Proof Set production resumed in 1908 all of the silver coins, including the 1908 One Peso, were struck in the newly authorized reduced weight and fineness. 1909 was the last year of production for Philippine Proof coins and the only year that the reduced size and weight One Peso Proof not circulated. I have a 5peso 1971 marcos silver. hi po ang ganda ng blog na to po though d ko pa nabasa lahat dito pero maganda thanks for sharing this to us.may mga coins din ako dito mga 1972 5 peso coins at mga 1 peso coins din panahon pa ni marcos.nais ko sanang ibenta to pero wala ako alam sa mga prices nito kailangan ko kasi ng pera ngayon hehe.sana may alam kang taga cebu na gusto bumili ng mga coins. I have a few of old Philippine coins from the late 70s to early 90s, I wonder where I can sell them for their accurate value. I have 1 dollar US coin, 1895. How much? hi! i have filipinas coin 1938 and 1945. us coins 1925, 1929,1935, 1936, 1940, 1941, 1942, 1943, 1944 and 1958. interested buyers pls txt me 09061406508. ty. bing. mr collector magkano ho ba ang buying rate ng isang alfonsino 1885 na coin? I have a lot of 1972 and 1974 old 1 peso coin. Where could I sell this? And also about 40pcs 1944 (US) 1 centavo coin. Hello, im from mandaluyong and what can me about selling this 5 piso 1991-1994 in bulk. or any coin buyers that you know in manila that buys this. hi.. looking to sell some of these old coins to interested buyers.. if interested you can email me at donjuegodelavida@gmail.com .. i am from iloilo city.. thanx..
10,000 pesos in a coin? That is just intense :O. Parang sayang kung mawawala na 'yan sa ilalim ng kama XD. I have 300 pieces of 1972 & 1974 Philippine coin. I want to sell it at a very negotiable price. Just text me @09189549380 or email francojenalyn@rocketmail.com. Thank you! Thank you and more power to all! 5pcs. 1958-1960 50 CENTS COINS. All very good condition.. FOR MY INFORMATION SIR, VALUE PO NITO LAHAT NGYON ? Amir po from mindanao. maybe 2-5x their face value if uncirculated. If it is well circulated, may gasgas walang gaanno value. i have a 1995 world youth day commemorative medal but its not the same as the one pictured above. it has the words"as the father sent me so i am sending you" on the obverse and it is made of nickel brass. how much can i sell it for? mga sir and maam, meron po akong 10 pesos na bill na sa harap po eh Portrait of Fathers Burgos, Gomez, and Zamora at left, Central Bank Seal, Type I at lower right at sa likod Urdaneta and Legaspi Monument in Manila. nabebenta po ba un? at meron din po ako mga bills ng ibang bansa mga 1980's po un. nabebenta din po ba un? tnx po sa mga sasagot..
Hello! I can see these posts are all Filipino coins but may I ask sir the value of an 1845 Seated 1 Dollar coin. Got it from my grandma this morning. Thank you! cno po may 1000 peso gold coin ni marcos? the 1904 1 peso is worth around 800 - 1400 peso depending on the condition. hi po do you know kung mgkano value ng kingdom of saudi arabia 100 years gold medallion.? tnx. sir ask lng magknu po yung mcarthur 25 peso un centinial coin 1880-1980? totoo po bng 10k php ung papal visit world youth day sa sulit? Hi..meron po akong 100piso coin 1908-1983 do you buy po ba?and how much kaya? salamat.. I have 2pc 1972 rizal's head 1 piso, 1985 andres bonifacio, 1985 jose rizal and 25 sentimo 1990. Looking for buyers text me 09068376790 thanks. Yesterday, I found a strange 1 peso coin in my pocket. It is a 2010 coin that has a shining gold color to it. It is identical to the standard 1 peso coin. Do you have any idea? Maybe it was plated or coated as a joke or a promotion somewhere?. i have an edsa revolution commemorative 500-coin still enclosed in its casing with original box and brochure and info of the coin still tact in. im selling it. how much are you willing to buy it? Email me at lumang.gamit@yahoo.com send me your list and photo. Hi! how much can I sell, 10 centavos dated 1944 & 1945?, 20 centavos dated 1919?, and 25 & 50 centavos dated 1964? 20 centavos dated 1919? - around 50-300 pesos depending on the condition. hello i have 20 centavos dated 1945 and twenty five centavos dated 1962 magkano po ba ito ngayon kung ipagbili? pm me if interested 09195972715. Around 2 - 5 pesos. Might be more if someone needs them. Who wants to buy 1 piseta 1944 espana coin? Pm me 09079694848 tnx. Those are quite common. Hindi pa gaanong nabibili iyan. hi Pinoy Kollektor mayroon akung 500,000 quinientos mil intis na may mukha ni Ricardo Palma BANKCO CENTRAL DE RESERVA DEL PERU ng 21 de diciembre de 1989 my halaga ba yung lumang pera n to? hi.. Pinoy Kollektor..meron po aqu mga old coins like nung mga nasa post nio..mbibili nio po b ito..123pcs po lhat..
Hi po Pinoy Kollektor. bibilhin nyo po ba yung 1 Peso 1970 MARCOS - POPE PAUL VI VISIT Nickle Coin? if yes, magano po? How about the latest 10 peso coin? yung commemorative coin po ng 150th year ni apolinario mabini? bumibili po ba kau ng 50 peso 1975 Ferdinand Marcos coin? ?if yes magkano po? How about 1907 US-PH 1 peso coin? No I am not buying them. They are worth 3-5 pesos each. I have 2,000 Philippines pesos centennial with original case in mint condition willing to sell it so how much? magkano po 1907 50 centavos??? yes its true. there are no 5 peso year 2000 coin in circulation. Sir, Uncut (Rizal not in the middle) 1972 1 peso coin what the value? how much can i sell,1 dollar dated 1971 queen elizabeth bahama islands coin? may gusto po bang bumili ng 1 peso paper bill ni rizal? Hi ask q lng po if bumbli po kyo ng 1975 5 kroner danmarks droning? Pati po mga commemorative n 5 and 10 pesos? and lots of other coins..
if interested please email me at angeliquemangeles@gmail.com so I can send you pictures of the items. Hello po i have 5 peso bagong bayani commemorative coin dedicated to OFW bumibili po ba kau nito?? Txt me 09065798135..thanks! May experience po b kayo bumili online ng mint ailver coins at iship sa pinas? Balak ko po kc bumili iniisip ko lng ung process alam nyo nmn saatin. Saka may alam po b kayo trusted silver coin dealer? I have 6 1963 coin.how much is it worth? i have a 1995 papal visit coin <pope john paul II call me if youre interested. I have a 1000 marcos gold coin, pwede ko po bang ibenta sa inyo?